Tips, Advice & Discussions about the upkeep of your home! I have an older deck that I’m going to put new decking boards on. Originally, I was going to use composite boards but the guy at Lowes questioned why I would spend so much to put boards on a deck that would probably out last the underlying structure. He suggested pressure treated pine or cedar. He said the pressure treated did not/should not to be stained, painted or sealed because the chemicals used to treat it would continue to outgas. So if I go with pressure treated or cedar are they maintenance free? Deck maintenance is not something I do, that’s why I’m replacing. Concrete is not an option. As for the joists, they seem to be good so I plan to paint them to protect them from any future damage. They will only be seen through the gaps in the decking boards. Let me state up front that I do not usually recommend installing new decking boards on an old frame. It is my opinion that replacing everything at the same time will result in better long term satisfaction with the resulting deck than a piecemeal approach. With that being said the following information may help you make a decision on how you want to proceed. When you remove the existing decking boards, examine the tops of the floor joists where the nails or screws that secured the decking boards penetrated. If the nails or screws caused the top of the joists to split lengthwise as they often do, The joists may be unsuitable to properly hold the new screws that will be required to fasten the new decking boards. If the existing framing is sound it is acceptable to install new decking boards on it. Whether you use composite or treated is a decision dependent on your taste and budget. Painting the old floor joists will have little or no effect in prolonging their life expectancy but it is fine to do so if you want. If you decide to paint them I suggest using a solid color latex stain instead of paint as it will have better penetration into the wood. Composite decking is generally three to four times as expensive as treated wood decking but is largely maintenance free. Warranties vary from around 20 years to lifetime on composite decking but I feel 15 to 20 years is the maximum that should be expected. Once it has dried for a few weeks treated decking may be stained with an oil base stain to achieve a desired color but oil stain alone will not significantly prolong the life of the wood. 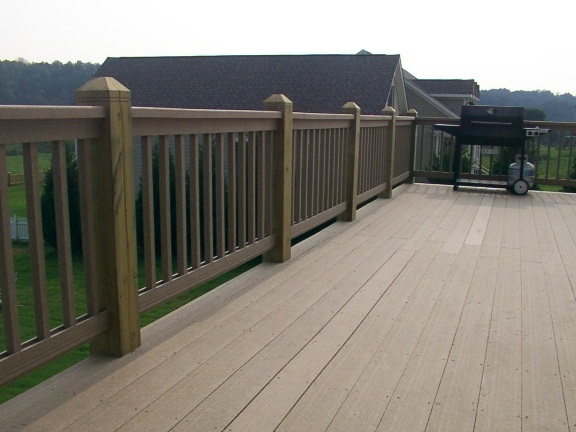 Oil stains followed by a sealer or a combination stain and sealer product will prolong the life and looks of a deck. Because of the decreased effectiveness of the current treatment process I now recommend to all my clients that new treated decking be sealed with a clear or pigmented deck sealer as soon as it dries out and every three to five years thereafter. The new treatment process has not been in use long enough for me to have a firm opinion on the longevity of treated decking that has not been regularly sealed but my observations so far suggests it is significantly less than asserted by the manufacturer. Latex stains in simi or solid color will prolong the life of the wood but it will need to be repeated every few years to do so and to remain aesthetically pleasing. I am not a fan of latex stains or paints of any kind on deck floors due to foot traffic wear patterns and peeling issues. You may gain some more insight on how to protect and prolong the life of your deck by reviewing the following articles on my blog. Did you enjoy this post? Tell us what you think in the comments box below. Wood’s Home Maintenance Service offers solutions for a wide range of building, maintenance and repair needs. Give us a call or click the button below to contact us today for a free estimate. Tony is a life time resident of North Carolina with over 30 years experience in multiple facets of the industrial, commercial and residential construction industry. For the past 23 years he has owned and operated Wood's Home Maintenance Service, providing services primarily in Johnston, Wake and Sampson Counties of North Carolina. ______________ ______________________________________________________ The information contained in this Blog is opinion derived, from hands on experience of over 30 years in the construction industry and by extensive research by the author. All postulations are referenced to the geographic location in which this experience was gained. This entry was posted in Decks, Exterior Maintenance, Questions and Answers and tagged Deck, deck maintenance, Deck repair, deck sealing, deck staining, decking boards, Decks. Bookmark the permalink. Check out my interview, Siding Installation Process on North Carolina Homes, one of the top sites for North Carolina homes for sale, including Mooresville, NC homes for sale. North Carolina Homes also services Florida real estate and Georgia real estate. Want to see some of our work ? HOME REPAIR: DIY OR HIRE A PROFESSIONAL? Laminate flooring ~ why is it not laying flat? Vinyl windows are a smart investment! The hesitant salesman ~ Is Wood’s Home Maintenance Service the right company for you?